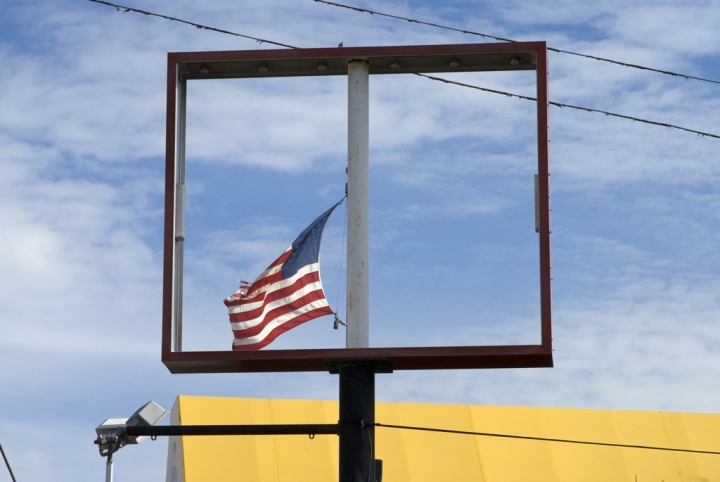 Stripped Signs, an exhibition of photographs by Chicago-based artist Gina Grafos is currently installed at TaRLA Transdimensional Art Portal (i.e. the art gallery in my house) and may be viewed by appointment through the end of September. Gina Grafos. Flag. Archival inkjet print, 2011. 24 x 16 in. Onetime Seattle resident Gina Grafos left the left coast in 2007 to pursue an MFA at Washington University in St. Louis and is currently based in Chicago. Her new body of work explores an ongoing obsession with semiotics. By finding and photographing physical signs that have been stripped of their content, Gina creates poignant images that provide powerful, multi-leveled inquiries into the nature of communication. We had an opening party on Sept. 2 and the work looks amazing in the space! Email me to set up a time to see the show if you missed the opening.